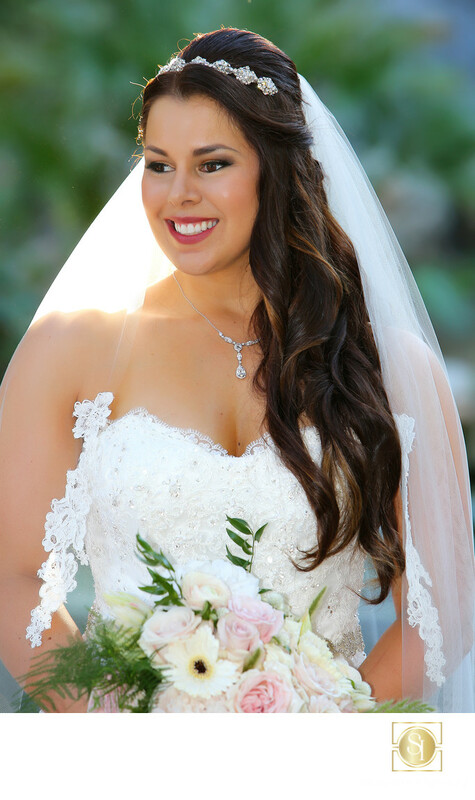 Courtney was our first bride of the year at Paradise Falls in Oceanside, Ca, up in North San Diego County. A beautiful girl, and so happy in love, too. She was another of our brides who just loved the camera and the camera loves her back! A gorgeous summer San Diego day gave us some incredible light for the photos, there are so many great places to shoot at that venue. Here, she's nicely backlit and just a touch of fill flash makes for a really good bridal portrait. I shot this with my Canon 5D mkIII and 70-200 f2.8L IS while Heather was taking a full length portrait from my left. Keywords: Outdoor wedding (90), Paradise Falls (6), Paradise Falls wedding (12), summer wedding (6).